How Can You Kick A Bad Habit? Today Alissa Walker addressed our reliance on the bottled water industry and mentioned many different ways to quench your thirst. Other habits that are harmful to ourselves or the environment often don’t come with ready-made alternatives. 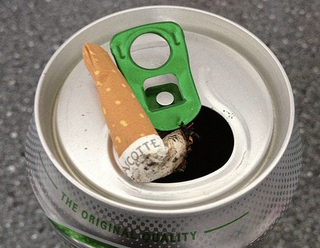 So how do you break a nasty habit? I always swore I was going to quit smoking before I turned 30, but that deadline has come and gone. I know it’s an insidious and unhealthy thing to do, and while I’ve cut back and taken many breaks, I’ve never fully quit. Lately I’ve been trying to sub in e-cigarettes, especially for throwaway smoke breaks like walking to the train. While e-cigarettes may not not exactly be a “healthy” alternative, they’re probably better for me than the other kind. Have you ever successfully reversed an everyday habit? Can you teach us how?